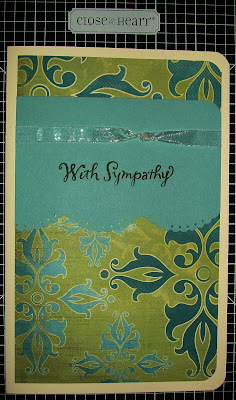 Here are two Sympathy cards made with CTMH products that I made for a neighbor and friend at work. The first card is made with cardstock and B&T Duos from our Emporium Level 2 Paper Packet (X7105B). The ribbon is our 3/8" wide White Daisy Organdy (Z209), the My Acrylix Stamps are from Best Wishes (C1318), and I used a border punch from EK Success. 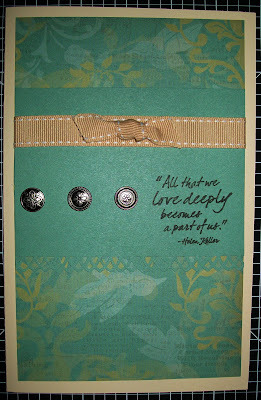 The second card is made with cardstock and B&T Duos from our NEW! Veranda Level 2 Paper Packet (X7119B-available January 1, 2010). The ribbon is from our Creative Basics Veranda Collection - 5/8" Creme Brulee Grosgrain Ribbon with White Daisy Stitching (X5809), the brads are Pewter Designer Brads (Z1146), and I used a Martha Stewart border punch. I hope you enjoyed looking at my latest cards! Have a great weekend. Gail I really like your cards. I love the quote on the bottom card. I really truly believe this~ everytime something really funny just pops out of my mouth I think of Dad. Whenever I start talking to a stranger in the store like I have known them forever I think of mom.They are definately part of me forever!